Twin 8 year old brother and sister Surya Kumar (right) and Nila Kumar (left) of Bethel both placed in Forms and Fighting in their respective divisions at the 3rd Annual Western Connecticut State Soo Bahk Do© Championships. The tournament was held at the Saint Mary School in Ridgefield, CT on June 7th, 2014 to benefit the US Soo Bahk Do© Moo Duk Kwan© Foundation (soobahkdofoundation.org), a 501c3 public charity. The aim of the Foundation is to provide those less fortunate, the qualities of leadership and discipline, which a classical martial arts education like Soo Bahk Do© Moo Duk Kwan© teaches to succeed in life. 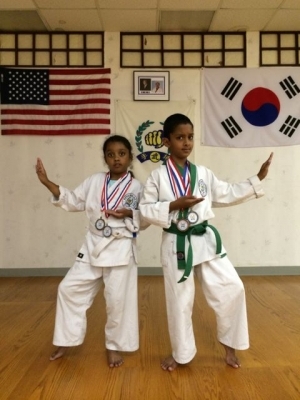 Both Surya and Nila receive their Martial Arts education from Han Dol Martial Arts School in Danbury, which offers classes 6 days a week from World Certified Master Instructor Frank Tsai (handol.org).